So I'm all moved into my new place - a million unopened boxes and furniture everywhere. It looks like Hurricane Hate on Christy came to town in my condo. Ugg... I can't move furniture where I want it because the boxes are in the way...so I have to unpack boxes to then move furniture and so on and so on and so on..
Today has been typical - dropped a wad of cash with Two Men & a Truck to move all of my furniture. It's worth it though. These guys have it down to a science. If you're moving, spend the money...hire a moving company. I've always used Two Men & a Truck and they are great. I definitely recommend them. After they left, two cleaning ladies stopped by -- they came highly recommended from a good friend of mine. The condo was clean before I moved in...but it wasn't clean clean. I'm a neat freak...and I just wanted someone to come in, save me some time, and put a little elbow grease into the important spots (kitchen and bathrooms) and make the condo smell clean. Well, the condo smelled clean, but after they left I inspected and found cob webs still in the window corners (after they told me they cleaned the windows), kitchen sink still scuzzy, bathroom floors dirty, tub obviously not cleaned... I was so upset to the point that I had a decent cry. When I get angry, I cry. It's annoying, but that's how I work. So now I guess I have to call them in the morning and play bad guy and tell them to come back... it was just not something I wanted to deal with this week. Why is it always so hard to find a good trustworthy cleaning person?? All I kept repeating in my head while wiping my tears and blowing my nose was..."If you want something done right...do it yourself." I guess being the control freak I am, I should know better. On top of that, I have to replace the blinds and stay on the phone bugging my realty company until they fix the holes by the front door lock (yes, holes) and the window that is supposedly hanging by a thread in one of the bedrooms. Ugg...And then, I have no idea how to turn on and off my porch light, lol. It was off yesterday and my BF and I tried every switch in the entire place with no luck. Well, tonight I randomly noticed it's on... no idea how it got turned on and I have no idea how to turn it off! Ahhhh!! So needless to say, I needed a nice cold glass of Chardonnay tonight... and I had a bottle I moved today from my old place. But... my wine openers were all packed... and remember I have like one million boxes all over the place.. no rhyme or reason to them. So a small bag of popcorn and a glass of wine for dinner tonight...the unpacking-palooza starts tomorrow after work. Wish me luck! Uh, moving is so frustrating! I hope the wine helped. Oh no! Just keep telling yourself that what doesn't kill you will make you stronger. I feel your pain, but it'll all be taken care of soon. 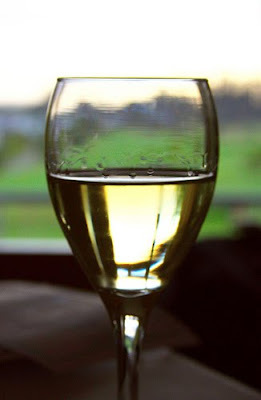 Just buy yourself another bottle of chardonnay on the way home today ;) Hope your night tonight is easier! i'm glad heaven smiled on you when you found the corkscrew....sometimes a little (or big) glass of something vintage does the trick! i'll have to try the woodbridge. sounds yummy! Call the cleaning ladies back to do what you paid for, ridiculous. Logically the light switch would have to be in an adjoining room for the porch light. It will pass you are right! Oh, girl that's why God made wine! I hope you enjoy a glass (or two!!). What a cute blog, by the way!!! I also cry when I get angry! If you make me angry enough to the point I cry - WATCH. OUT! hahaha I hope you get everything figured out! Put some pictures of that new CONDO!! !